The Pure Move 2520 is now discontinued. You may be interested in the newer Pure Move R3 which comes in white with a bronze band or black with a silver band. The Pure Move 2520 is a pocket digital radio that’s ideal for listening to sport commentaries thanks to its rechargeable battery. The built-in ChargePAK is charged with a USB power adapter and provides up to 15 hours of radio listening. With new digital sport and talk stations available across the UK it’s a good time to pick up a pocket radio. The radio can tune into digital and FM stations, so you shouldn’t miss out on a commentary on BBC local radio. The personal radio is just as good when it comes to music radio stations, like Absolute 80s and KISSTORY. In-ear noise isolating headphones are provided in the box. Extra control over the sound is possible thanks to the bass and treble controls. Externally the Pure Move 2520 is available in a brushed silver aluminum case or black aluminum case with mirror finish back. A protective gel case is available for around £10. Stations are selected with a rotary control which makes scrolling through the list of stations quick and easy. Volume is also controlled with this rotary wheel. Pure’s pocket radio weighs in at just 105 grams including the battery – that’s lighter than an iPhone. The station name, scrolling text, time, battery level and signal strength is displayed on the backlit display. All of the essential information is shown at once, so you won’t need to hunt through menus or toggle information on the display. A lock slider at the top of the radio prevents any accidental use of the buttons, which is useful when the device is in your pocket as you walk or when you’re running. Sensibly the headphone socket and micro USB port are found next to each other at the opposite end of the radio. Rechargeable batteries are useful and save money, but eventually performance won’t be what it was when the battery was new. The ChargePAK is removable so can be replaced as required. It’s ten years since Pure released the PocketDAB 1500 personal digital radio. 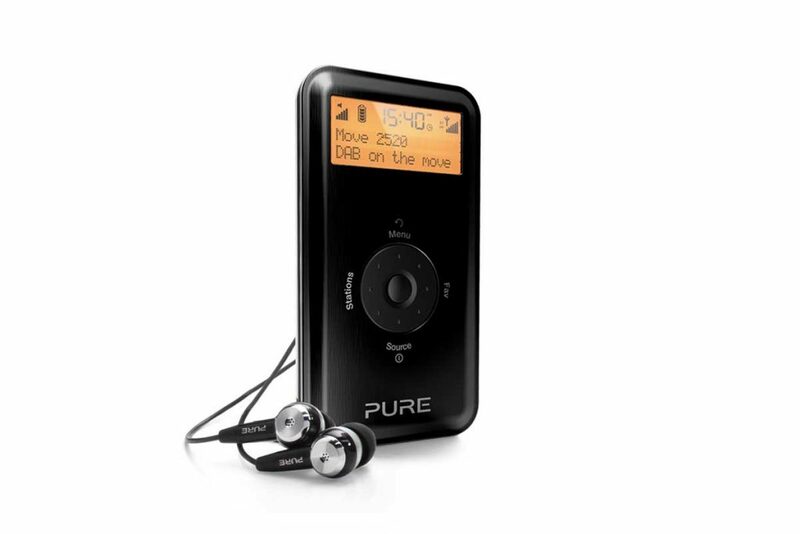 The latest personal DAB radio from Pure, replacing the Move 2500, is still one of the best you can buy. Verdict: Solid construction, rechargeable battery with 15 hours listening time and simple rotary dial make the Move 2520 ideal for listening to music on the go and sport commentaries.